Cudahy, California Truck Accident Personal Injury Lawyers -- Over 40 Years of Truck Accident Experience You Can Count on! Are You in Search of a Truck Accident Injury Lawyer in Cudahy? Our Cudahy, California truck accident injury attorneys and personal injury and wrongful death law firm promise to assist you with your truck, car or motorcycle accident injury claims or other personal injury or wrongful death accident claims. Being involved in a truck accident or other personal injury accident in Cudahy or anywhere in California can have a lasting impact on your health and finances. Our personal injury lawyers for Cudahy, Calif. will represent you and assist you or the families involved in wrongful death claims. We will not only provide you focused attention, but will empower you with pivotal information, strategy and our extensive resources regarding your truck accident injury claims. Cudahy is the second smallest city in Los Angeles County, but is amongst the most densely populated cities in the United States. According to the 2010 U.S. Census, Cudahy has a total population of 23,805. Some of the cities that border Cudahy include South Gate, Bell Gardens, Commerce, Downey, and Huntington Park. California is home to some of the world’s largest ports in the world and is the most populace state in the United States. Thus, the number of large commercial vehicles passing through Californian highways is more than any other state. 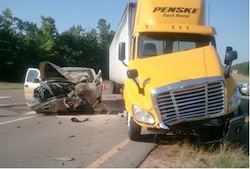 Every year accidents involving large commercial vehicles result in an estimated $40 billion dollars in property damage. These truck accidents result in more than 3,000 fatalities and over 70,000 severe injuries each year. Truck collisions are common on California’s major interstate highways, populated cities as well as less traveled urban streets. Truck accidents, due to the large size and weight of trucks, often lead to some of the most severe and fatal types of injuries. Our truck accident lawyers and personal injury & wrongful death accident law firm provide professional support as well as the freedom to allow our injured clients to focus on their recovery process without facing the complicated hassles of the legal system. Based on the statistics by the National Highway Traffic Safety Administration, any truck collision can lead to tragic outcomes and injuries, from minor scratches to fractures and serious head injuries. The most common injuries caused by truck accidents are spinal cord injury, traumatic brain injury, facial injury, broken bones and internal organ damage. Such injuries often require extensive medical attention and rehabilitation care, sometimes amounting to hundreds of thousands of dollars in hospital and other medical expenses. Our experience in truck accident personal injury claims and wrongful death accidents will help you understand the intricacies of such claims and assist you in recovering appropriate monetary compensation. If you or your loved ones were involved in a truck accident, need assistance with other personal injury claims or have a wrongful death accident claim in Cudahy, Los Angeles, Burbank, Riverside or any other place in California, please get in touch with our truck accident injury lawyers and our legal team now for a completely FREE CONSULTATION and CASE EVALUATION. With our support, claim your rightful compensation for your truck accident personal injury claims. Our initial consultation and case evaluation are absolutely FREE of any charge and we usually work on a contingency fee which means that we receive NO Fee Until You WIN! There are many time deadlines and procedural rules so please contact us now. You will be glad you did! We offer: FREE consultations on injury accident claims and NO fee until you WIN!